You are here: Home / Baseball / What would a 1908 Cub say to a 2016 Cub? 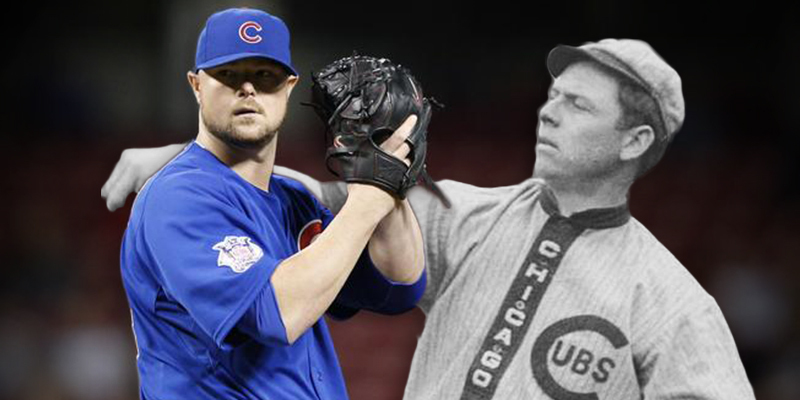 What if a young Mordecai “Three Finger” Brown could sit down with the future Hall of Famer and 36 year old, Jon Lester? What type of conversation would ensue? The differences in appearance, salary, careers and fame are very apparent but there’s one common denominator. These men are both answers to Cub fan’s prayers. Brown could boast about his impressive 29 wins during that 1908 season or possibly even taunt Lester with his very impressive 1.47 ERA. No matter what the statistic, Brown would have reason to brag. That wouldn’t stop Lester from having the ability to toot his own horn however. Lester has been dominant this season. With 19 wins he struck out 197 batters through a little over 202 innings. If I told you that you could have a pitcher that would average almost one strikeout per inning and give up only 154 hits, how much would you think that is worth? It could be argued that Mordecai had an unfair advantage over a century ago. It wasn’t that he played in front of only 12,000 fans on average (during the World Series) alleviating him of some in-game pressures. It wasn’t that he faced teams that had less capability to scout pitchers and their tendencies like they do now. His advantage was his index finger, or lack there of. After losing his index finger due to a farm equipment accident he was forced to grip the baseball differently. This gave the ball a very interesting spinning motion–one which many batters couldn’t figure out. Lester will not have this advantage during this year’s postseason but what he does have is a very impressive young cast of hitters. The young Cubs have put up numbers that would even make Steve Bartman smile again. With Anthony Rizzo and Kris Bryant leading the team in batting average along with Bryant’s home run ticker adding up, they seem to have no issues offensively. Brown and his 1908 Cubbies wish they had the power numbers of their 2016 counterparts, especially with all the long ball support that Lester receives from his teammates. Brown passed away in 1948 without ever seeing the Cubs take another World Series. I think he would be a very happy man watching these young Cubs on their run despite how differently the game is played compared to his time. I can only assume if he did get a chance to sit down with the Cubs of today he would most likely find a way to talk about the fans. Win or lose, Wrigley Field will be packed and Chicago residents will talk about this being their year. Summer in Northeast Chicago has long since belonged to the Cubs and for the first time since 1908 they’re looking to own October again. If Chicago can end this season as World Series champions each player will take home over $350,000 as a bonus, which is a far cry from Brown’s $1,318. I think it’s safe to say Lester would be picking up the tab in any celebratory outings.